To do anything of value- you risk failure. To step out of your comfort zone and do something new- you risk failure. To create something new, you risk failure. To grow, you will try, fail, try again and grow. Fear is always an option…failure is not. The truth is we spend more time in fear than in faith. The truth is that it is time to face your fears and take failure off of the table of things you just can’t do. God calls you to something you have never done before and you think, “what if I fail?”. So what if you do? You will never grow if you never fail. 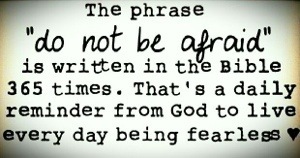 The truth is that the question you must ask is “what do I have to fear?” . I have the answer: nothing. You have nothing to fear. “Therefore put on the full armor of God, so that when the day of evil comes, you may be able to stand your ground and after you have done everything, to stand. Stand firm the, with the belt of truth buckled around your waist.” Ephesians 6:13-14. What would you attempt is failure was impossible?